UFC 234 // Live & Loud on our Mega Screens Come and enjoy a cold one while watching all the action LIVE in our Sports Bar with Terrace Balcony and Food serving from 11:30am! Stick around after the fights for LIVE MUSIC Downstairs in the MAIN BAR from 3pm. 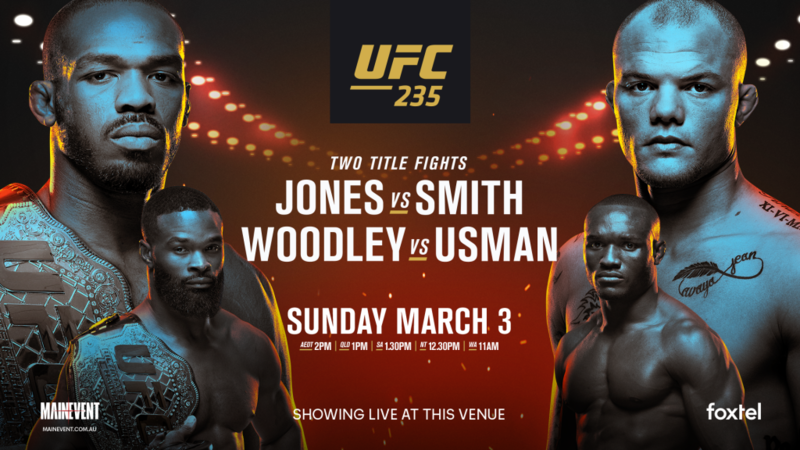 UFC 235: Jones vs. Smith is an upcoming mixed martial arts event produced by the Ultimate Fighting Championship that will be held on March 3, 2019 at T-Mobile Arena in Paradise, Nevada, part of the Las Vegas Metropolitan Area. A UFC Light Heavyweight Championship bout between two-time champion Jon Jones and challenger Anthony Smith is expected to headline the event A UFC Welterweight Championship bout between current champion Tyron Woodley and The Ultimate Fighter: American Top Team vs. Blackzilians welterweight winner Kamaru Usman has been slated for the event and is expected to serve as the co-headliner. As a result of the cancellation of UFC 233, a welterweight bout between former UFC Welterweight Champion Robbie Lawler and promotional newcomer and former Bellator Welterweight World Champion Ben Askren (also former ONE Welterweight Champion) was rescheduled for this event. A women's bantamweight bout between former UFC Women's Bantamweight Champion Holly Holm and Aspen Ladd was expected to take place at the event. However on January 31, it was reported the matchup was scrapped due to undisclosed reasons and both fighters are expected to face new opponents in other events. Thomas Almeida was expected to face Marlon Vera at the event. However, Almeida pulled out of the fight on January 31 citing an injury. He was replaced by Frankie Saenz. Former interim title challenger Ovince Saint Preux was expected to face Misha Cirkunov at the event. However on February 11, it was announced that Saint Preux suffered an injury and was pulled from the fight. He was replaced by Johnny Walker. Yadong Song was expected to face The Ultimate Fighter: Latin America bantamweight winner Alejandro Pérez at the event, but pulled out of the bout on January 11 due to an undisclosed reason. He was replaced by Cody Stamann.